Successfully saved Easy Indian Lentil Soup Recipe to your Calendar. You can also save the ingredients to your Grocery List. 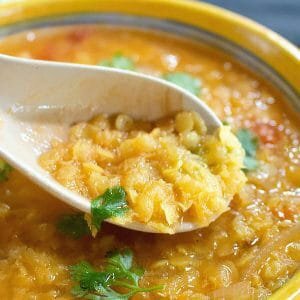 Flavorful not hot spicy Indian lentil soup with split red masoor dal lentils, a couple of spices and other healthy ingredients. This soup is great all year round but of course most suitable when the days get shorter and cooler. See notes for ingredient advice.